There was heavy speculation in some quarters that the President’s statement on Wednesday last week that rocked the political and diplomatic circles and also led to the resignation of the Director General of the Bribery Commission signalled that his honeymoon with Prime Minister Ranil Wickremesinghe’s administration was running low and he would not hesitate to take full control of the administration, including taking the Law and Order Ministry under his wing. In his most hard-hitting remarks since coming to power on 8 January, the President was visibly upset that the three main anti-graft organisations, including the independent Bribery Commission, was engaged in politically-motivated prosecutions. He also warned the secretaries of the independent commissions that it was he who had appointed them and they should know their terms of reference and must keep him informed about the high profile cases. However, none of this justifies the President’s comments in public against independent institutions or his decision to turn his back on the mandate he received; to take action against those who plundered wealth of the country. Many people were quick to jump into the debate and say the marriage between the SLFP and the UNP had hit the rocks. This speculation was further strengthened because the President had said he had been silent for too long, but had now decided to speak out and take corrective action. Health Minister Dr. Rajitha Senaratne, one of the top three architects of the 8 January election victory, was quick to defend his friend. He said at the weekly press briefing that despite Sirisena’s statements, the relationship with Prime Minister Ranil Wickremesinghe as well as the union between the two parties remains strong. There is a growing body of opinion that military commanders who led a successful campaign to crush separatist Tamil Tiger rebels in May 2009 should not be humiliated by bringing them to court, given their huge contribution to secure and save the future of our country. The problem the Government has is that the three former Naval Chiefs and Gotabaya Rajapaksa were accused of causing a loss of around Rs. 11 billion to the State through a private arms deal involving Avant-Garde security company. They face other charges too. The Government promised the public in January last year that all the corrupt deals would be investigated fully and those guilty would be brought to book. Therefore, unless the investigations are politically motivated, the public officials involved must be given the freedom to do their job without fear. The public also at the same time want the Government to run investigations against those officials in the current setup who are also facing corruption allegations. A COPE report on the Central Bank Bond controversy is expected to be made public. They also want all the problematic transactions on the stock exchange and financial markets that took place during the Rajapaksa period to be investigated fully and made public. Also, the public want a proper justification to be given on the payment of $ 115 million to cancel Airbus planes ordered by the previous regime. There is no doubt that both the President and Prime Minister want the Unity Government to run its full term till 2020. The President also has no power to dissolve Parliament. Therefore those waiting on the sidelines waiting for the Government to fall would do justice to the taxpayer if they either fade away or buckle up fast and focus on what they have to deliver to the public. On the other hand, President Sirisena’s outburst should not be taken very lightly. Because, the President is a very patient and a simple man. A person who still has the humility to pour a cup of tea for a visitor at his home. Therefore it is a clear signal that he is keen to build his own base and that he wants to play a bigger role to deliver on the promises he made without allowing a few people to take decisions according to a different timetable and to keep him in the dark. It also appears the President was venting his frustration at the slow progress of crucial investigations and acknowledged the Head of State was wary of repercussions from the powerful military establishment. But he needs to remember that the Common Opposition, championed by activists like the late Ven. Sobitha and Rathana Thero, intellectuals, lawyers and civil society inspired the public with a promised new deal. They told the public that the Government they had in mind would be governed based on the principles of ‘Yahapalanaya’ and that Sirisena with Ranil would fix the rotten political system and bring back dignity to the once-respected key democratic institutions. There was certainly so much of hope among the new voters that there was finally a way out of the mess and that men and women of integrity with no baggage or charges would be brought into the administration to deliver the promised Yahapalanaya. Sadly however to the die-hard supporters of Yahapalanaya these are days of fading hope and overwhelming despair and the disenchanted have given up and many of them are openly venting their frustration on social media. 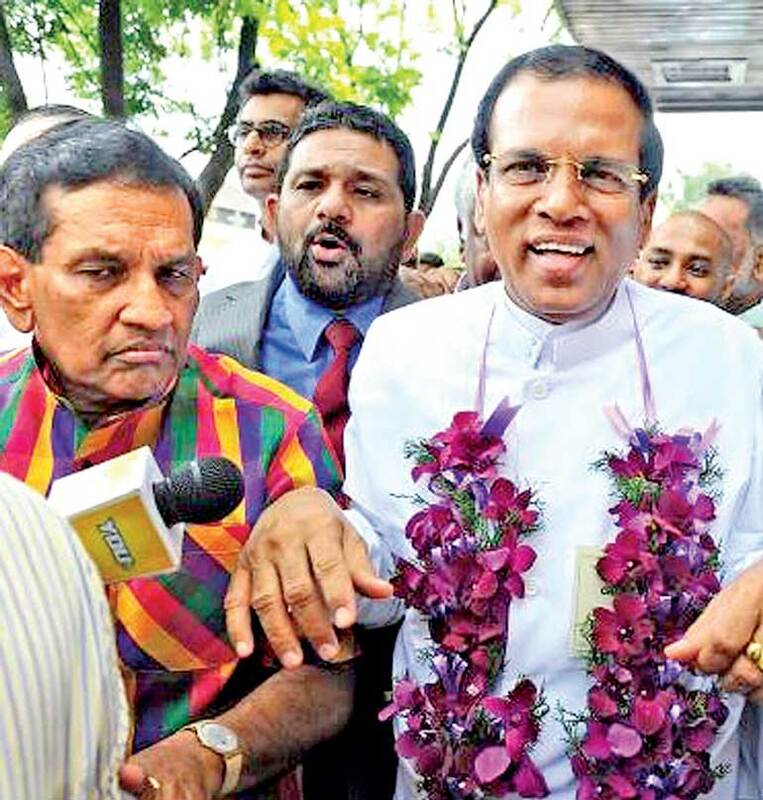 Therefore, the time is right for President Sirisena and Prime Minister Ranil Wickramasinghe to re-examine their mandate and do what it takes to deliver the promised political reform; if they don’t do that, they will only have themselves to blame, if the forces of 8 January struggle align against them. We have been through such experiences before, sufficient for a century? Do we not learn the lessons? History repeats itself for those who do not bother to learn from the lessons of the past.